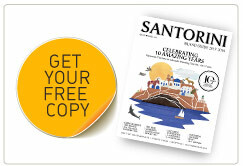 This year Santorini is celebrating. 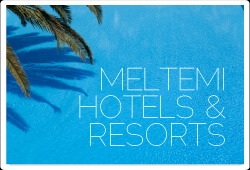 The Municipality of THIRA has declared 2013 the Year of Gastronomy and organized many events. Restaurant owners and chefs have prepared special menus, so that the visitors of Santorini can taste the unique products born out of the volcanic soil of the island. This movement has brought Santorini to the spotlight, and we are giving you a first taste of these events and everything you should seek to fully experience your gastronomic journey in Santorini..
Mr Anastasios Nikolaos Zorzos, the Mayor of Santorini, informs us about the Year of Gastronomy, makes proposals about what tastes and flavors we should not miss and shares with us his vivid gastronomic memories from Santorini. Conceiving the idea for the Year of Gastronomy. 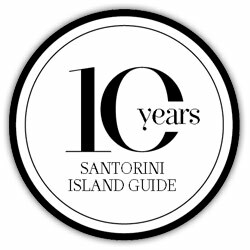 ‘The year 2013 constitutes a landmark for Santorini in a period when tourism -specially focusing on Thematic Tourism- is promoted to a major issue for the economy of our country. 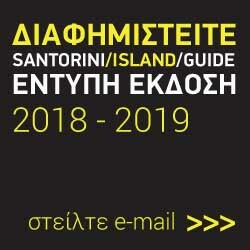 In order to promote the methodic and collective efforts of many years, the Board of Municipal Council have declared the year 2013 THE YEAR OF GASTRONOMY IN SANTORINI’. The visitors of the island should not miss experiencing ‘unique agricultural products, exquisite restaurants, hospitable tavernas, worth-visiting wineries, romantic hotels, special corners selling local products, all composing a creative setting of gastronomic delight’. There will be an inexhaustible variety of specially made menus, exceptional wine-tasting sessions, delicious breakfasts with Santorinian products. Conferences, wine and food exhibitions, local gastronomic events and many other cultural events will take place throughout the year.What you should discover on the occasion of the Gastronomy Year. ‘This is a multi-dimensional event connecting the past of the island –the era of the prehistoric settlement in Akrotiri– with today, while promoting the particularity and fertility of the volcanic soil of Santorini. An event integrating all aspects of contemporary life in only one tourist destination: gastronomy, wine tasting, arts, tradition, scientific documentation and, generally, culture’. The Mayor’s favorite Santorini product. ‘Santorini has unique agricultural products. 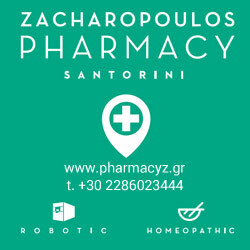 When people ask me to name my favorite product of the island, I always find myself in a dilemma, for it is really hard to choose the best among all Santorinian earth products. However, if I had to name only one, I would definitely pick the grapes and vine. Besides, I come from a farmer family who had always been dealing with vineyards and wine production. I know all different Theraic grape varieties, I can tell one from another, I have knowledge about vine cultivation and I am aware of what makes a good wine. This is what is called ‘experiential knowledge’. The most vivid gastronomic memory from the Mayor’s childhood. ‘It was a summer morning when my mother and I went to Megalohori to meet my uncle Giorgos Venetsianos, well-known Wine Chemist-Oenologist, co-owner of the first winery of the island. I was 8-9 years old. We were in his chemistry lab and I asked my uncle to let me try what he was trying. He refused to satisfy my desire, telling me that that was not good and he would let me try a little bit of something that I would definitely like. So, I tried Vinsanto while my uncle first was explaining to me that I would be allowed to drink Vinsanto only when I grow up. The great taste combined with the fact that it was something forbidden for me then, have been strongly and magically printed in my memory’. The heart of gastronomic Santorini ticks here. In order to taste the original Santorinian products, look for dishes prepared with local ingredients such as fava beans, the Santorini cherry tomato along with their derivatives, such as tomato juice, tomato paste, sun dried tomato and white eggplant in all restaurants on the island. Enjoy traditional dishes such as tomato fritters, fava, korkosela and more. Moreover, chefs and restaurateurs put their creativity and suggest many original recipes inspired by the rich culinary history of the island. The Year of Gastronomy could not possibly exist without Santorinian wine. Besides the strong, rich wines of Santorini, there is also a great variety of delicious dish surprises waiting for you at the wineries of the island. Every Monday, Wednesday and Saturday there are Cookery lessons taking place at Gaia Wines, in cooperation with the Nichteri Restaurant. On the first Saturday of August, the Ventema Feast will take place at the Theraic Products Association, celebrating the onset of vine-harvesting with great food and music. At Gavalas Winery there will be vertical wine-tasting sessions for the Katsanos wine of years 2010, 2011 and 2012. At Ktima Sigalas Winery, all dishes to accompany wine tasting are made of products coming from Santorini and other nearby islands. When visiting Koutsoyannopoulos Winery, have also a visit to the unique Wine Museum. At Estate Argyros, you can also taste the Vinsanto 20 years barrel aged, which is the oldest and the most aged vinsanto of the island and very highly awarded all over the world. Don’t miss a piece of the vinsanto Argyros chocolate. A wide range of exhibitions and cultural events will take place this year in Santorini with reference to Gastronomy. Some of these events are the Cartoon-Caricature Exhibition entitled ‘Gastronomy in Santorini’ (until 10th August) in Estia, Pyrgos Kallistis, the photo exhibition by Dimitris Talianis ‘Ampeloessa Santorini’ (19th June-19 July) at the Bellonio Foundation, the exhibition ‘Proionta-Magiremata-Trapezomata’ ((20th August-30th September) in Estia, Pyrgos Kallistis, and the 2-day seminar ‘Nutrition and Cultural Identity’ (19-20 September) at the Petros Nomikos Conference Center. For further information, visit www.santorini2013.gr/calendar. Learn everything about where and when all thematic events of the year of Gastronomy will take place.